Pacific Media Watch, a regional watchdog project of the Pacific Media Centre, today joined the Paris-based Reporters Without Borders (RSF) and the European Federation of Journalists (EFJ) in condemning the massacre of cartoonists and journalists in a savage attack by masked gunmen on the satirical magazine Charlie Hebdo as a “barbaric act”. “We weep for the victims of today’s horrific attack on Charlie Hebdo, who include the cartoonists Charb, Cabu, Tignous and Wolinski and Bernard Maris. “Our thoughts are with these colleagues and friends, who have been taken from us by hatred. There can be no worse attack on media freedom, and all other freedoms, than to storm into a media outlet and shoot on sight. “We will continue our fight for freedom and tolerance in the face of this barbarity. We will do it for them and for all those who have fallen in defence of such fundamental values as freedom of information. Pacific Media Centre director Professor David Robie at AUT University said this was an outrageous and cowardly attack on the controversial magazine’s editorial staff and a “terrible blow against freedom of expression and press freedoms everywhere”. “But in spite of the savagery of this attack against unarmed cartoonists and peaceful media co-workers by religious zealots, the pen will still emerge mightier than the sword. The global “Je suis Charlie – I am Charlie” campaign is evidence of the worldwide defence of freedom of expression against tyranny,” he said. According to media reports, 12 people were killed in the shooting; among them nine were journalists (including three cartoonists and the chief editor, also a cartoonist) and two were policemen. 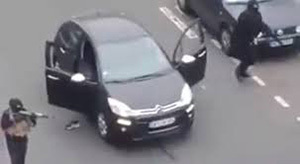 Media reported that at least two armed, hooded gunmen took part in the shooting at the office of Charlie Hebdo. A third person involved in the attack was believed to be a driver. The EFJ has expressed its deepest condolences to the families and friends of the victims. Mogens Blicher Bjerregaard, the EFJ president, will travel to Paris to honour the victims. The EFJ has condemned this barbaric act of violence against journalists and media freedom. It has called on the French authorities to make every effort to punish this horrific crime. “This is not only an attack on journalists but also an attack on the freedom of the media. Journalists today are facing greater dangers and threats,” said Blicher Bjerregaard. In 2014, 118 journalists and media workers died for doing their jobs. In Europe, nine journalists were killed, mostly in Ukraine. In view of this horrific attack, the EFJ reiterates its call on national governments, the European Union and intergovernmental organisations (including the Council of Europe and the Organisation for Security and Cooperation in Europe – OSCE) to intensify their efforts in ensuring the protection of journalists in Europe.